Apologies everyone that I took so long to finish this last review. As you can see from my previous post, it has been no less than dramatic weeks. I have recovered from my Flapper Nightingale days and I am so happy my grumpy old brother is back to his normal self! And now, it gives me great pleasure to indulge in some frivolous writing and introduce you to one of my favourite-st toy - The NERF Ball Blaster - which also marks the end of my first season of toy testing for Kohepets. As many of you might know by now, I am quite the toy fanatic. Don't see me old and distinguishably white. Old man still loves toys. Old man still loves playing fetch and catch. Nothing makes me happier than going out to play. Miss U from Kohepets, "Flapper, why don't you try the NERF Ball Blaster? I think you will love it?" "Hmmmmm.....", I raised my blonde eyelashes in doubt. I quickly went to snoop their online store to check it out. Click on image to go to actual product page. As mentioned in my NERF Bash-Toys post, I had never heard of this brand prior to this. Based on the product photo, it was clear to see it was a 'gun' toy that fired tennis balls. SGD58.00.... I expected a ball-blaster to be more costly so I started to imagine the toy to be some cheapo plastic-ky toy with like creaky crappy mechanism that would die after a few rounds of play. And! 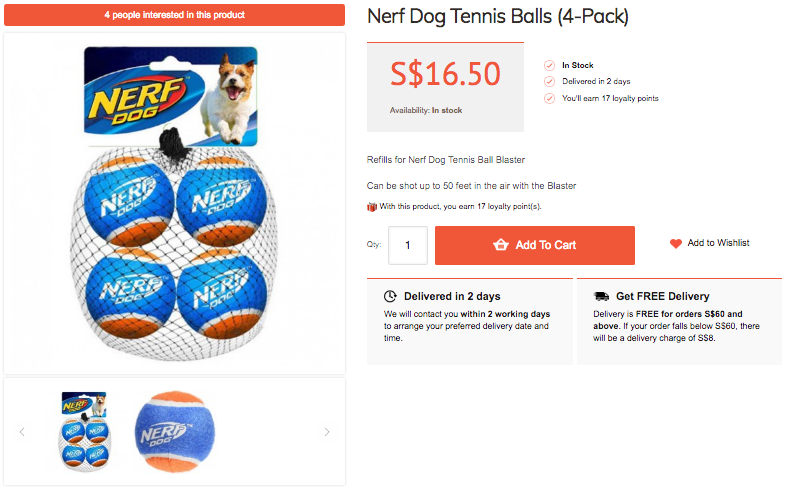 Judging by the fact it sells extra NERF Dog Tennis Balls, I thought it would be the 'Apple' of dogs toys where everything knick-knack is specifically NERF. 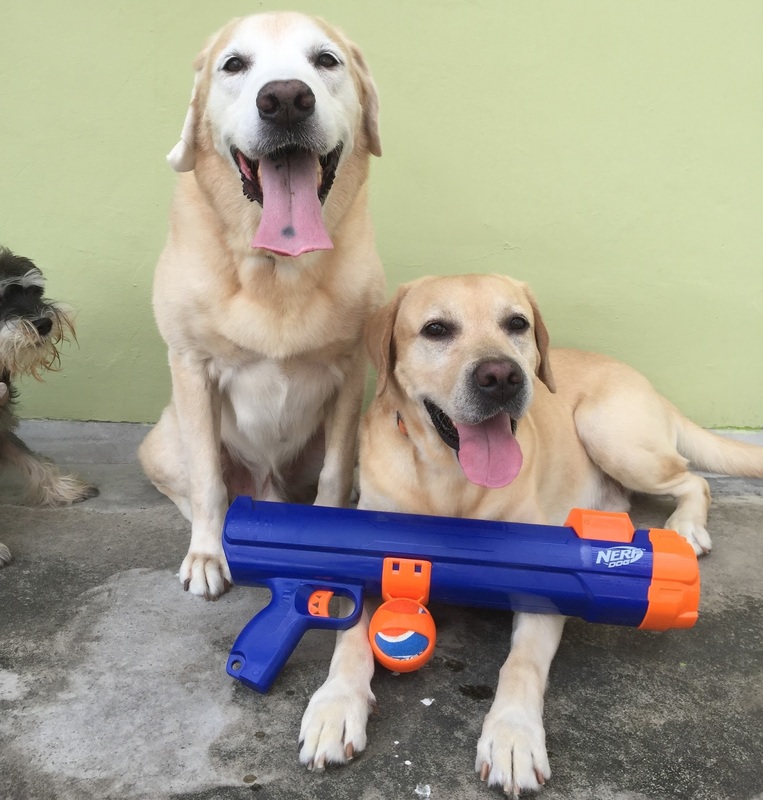 Could NERF be the 'Apple' of dog toys? NEVER JUDGE A NERF BY ITS PRICE. My brand new NERF Ball Blaster right out of the box! It exceeded expectations - TOTALLY! When my Kohepets package arrived, I immediately dived in to dig out the NERF Ball Blaster (BB). By the time I was done with my online purchase, this was the 'IT' toy I was looking forward to. How exciting to have that ball-blasting gun! And at first touch, this SGD58.00 toy exceeded expectation. It was not some cheap mama-store type toy plastic. The plastic quality was equivalent to NERF's human toys. I quickly cut off those heavy-duty cable ties to start examining the toy. Ladies and gentlmen, purs and paws. We have a WINNER! Tried, tested, chop chop guarantee, the BB does fit regular-sized tennis ball. This is the first toy test review that I do not need to bring out my vernier calliper to measure ball sizes. Woohoo! 5-Flaps from me because this is what a call a 'dog-friendly' toy! NERF cleverly designed the BB such that it fits regular-sized tennis balls! Contrary to what I first thought when I judged the BB, the slider mechanism is actually smooth and easy to use. It does not feel like it will break or spoil after a few launches. The slider does not spring back to start position after each launch. You will need to manually slide it down to pick up the ball. There's a 'button' on the slider. PRESS the button while sliding for easy and smooth sliding - which you can see at the start of the clip, mummy forgot and the sound startled me a little. The end position of the slider determines the launch distance. Sliding it to the end (like what mummy did) launches the ball up to 50 feet = 15 metres. 4-Flaps because the slider was surprising smooth and impressive quality for its price! Minus one Flaps because the slider does not spring back to start position after launch. Mummy says I look like a cool ninja with the NERF BB sticking out of my haversack. Because it fits into a regular-sized haversack so the BB is portable. It has become my MUST-HAVE toy! Since I got my BB, I am not sure who does this toy belongs to anymore - the humans or the dogs? Clearly, the humans are enjoying the BB as much as Frodo and I enjoy chasing after the balls and it just brings out the pup in them. We did triple ball blasts but we cannot find the footage. Meh! Super Uber love the BB! Super Uber Fun! Fun but erm... where does the ball go? This is one review that I do not need to write much. I think the images tell the story of how awesome this toy is. I am highly impressed by its quality and its thoughtful design which included a ball holder as well! However, I do wish the slider springs back on its own after each blast though. But as what the humans concluded, if it has all that funky mechanism, either it is going to cost a lot more or it could end up being more fragile. And as you can see how the humans have been #LAB-testing the ball-blaster, I'm amazed the mechanism is still in-tact! Woof! So yes, that SGD58.00 was well-spent! Frodo and I love love love the toy. Uncle Nic, mummy and daddy love the toy too! Fun not just for Frodo and me, but for the humans too. The NERF Ball Blaster was the unexpected winner of my Kohepets toy loot. It is... and I say it one last time.... a MUST-HAVE toy. Good quality, durable, reasonably-priced and woof-dles of fun! Love love love the NERF Ball Blaster! Unfortunately, due to my curly-ear brother's recent medical drama, I was unable to finish this review in time before the Flapper10 promo-code with Kohepets ended. However, the Kohe8 promo is an ongoing promo for $8.00 off first time purchase. 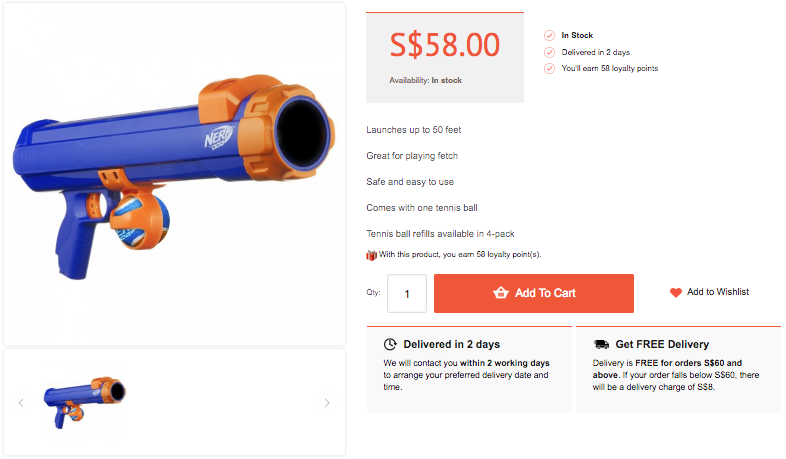 So for those of you who would like the NERF Ball Blaster, go get it now! And this review brings us to an official end to our first season of toy reviews for Kohepets which we have enjoyed toy-testing tremendously. Rumour has it... we will be receiving more toys in June to test! Woohoo!!!!!!!!!!!!! Not sure about you, my friends, but Frodo and I looovvveeee toys! A LOT. Till our next loot of toys from Kohepets..... Frodo and I are going to indulge in our fantabulous ball blaster!